Founded by Canadian William E. Baycroft, Yacht Consultants Asia (HK) Ltd. was established to address the needs of merging Western and Asian yachting communities. Our operations office is based in ShenZhen China about an hour by car, train, or Turbo Jet Ferry from its administrative office in Kowloon, Hong Kong, S.A.R. Our locations allow easy access for clients, talented trade and design crews, suppliers and manufacturers. As a team we focus on all aspects of pleasure yacht manufacturing regardless of size, substrate or hull form, from small custom or production gunkholers... to behemoth Superyachts, 50+ meters in length. Through our well respected International Network of employees and associates, YCA ( HK) Ltd finds solutions for your Yacht design, manufacturing, procurement or human resource needs. Yacht Consultants Asia (HK) Ltd., provides more than an introduction to Western, European and Asian Yachting communities, in that we safeguard your interests, with accurate detailed consultation, direct representation, practical sourcing, and cooperative follow up. 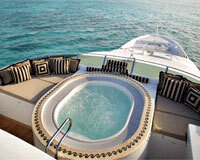 YCA (HK) Ltd services are directed toward individual yacht owners as well as yacht manufacturing companies. We're big on discretion, utilizing Non-Disclosure Agreements early in our relationships, protecting intellectual properties.